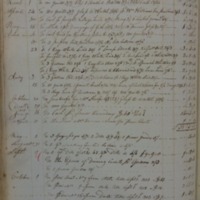 On July 15, 1800, the College debited Mrs. McDermott's account "To 3 days hire of. Zealeam [unclear] a 5/15/." Zealeam belonged to the Fevrier family, who had hired him out to the College two years prior.